a.1. 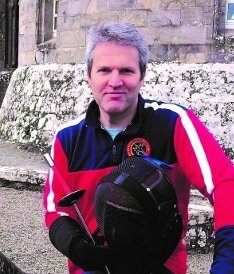 The club shall be called Munster Blades Fencing Club (MBFC). a.2. This constitution shall cover every issue of competence, validity, responsibility, power or duty pertaining to the Fencing Club which is affiliated to Fencing Ireland. a.1. Membership of the club shall be open to all. A person shall only become a member on payment of a membership fee and remains a member while fees are paid up to date. a.2. The membership fees shall be determined by the committee. a.3. Participation in all club activities, with the exception of Extraordinary and Annual General Meetings, shall be at the discretion of the committee. a.4. In exceptional circumstances, membership may be revoked at a Committee Meeting provided a two-thirds majority of members present and voting are in favour of it. This might be extended to include a lifetime exclusion from membership and/or other penalties and conditions. a.5. Any person who has rendered benefit to the club or to fencing in general may be made an honorary member of the club for life by special resolution at the annual general meeting. a.2. No person who has not held membership for three calendar months may vote in meetings. a.5. All committee members shall be elected by secret ballot on the system of proportional representation by means of the single transferable vote. a.5.i. In the event of a tied election, the committee member shall be decided by election by lot. a.6. Proxy voting shall be allowed if the member who shall be absent has informed the chair of their absence one week in advance. a.6.i. In the event of proxy voting, the returning officers shall vote on behalf of the absent member, maintaining the secrecy of the ballot. a.1. The Committee shall consist of two levels, the Executive Committee and the Associate Committee. a.2. The Executive committee shall be composed of the four executive officers, the Chairperson, the Secretary and the Treasurer. a.3. The General Committee shall comprise of the Executive and all other positions in existence at the time. a.5. The committee may appoint up to five other members of the committee and allocate portfolios to these members of the committee. These shall compose the membership of the associate committee. a.6. Committee meetings shall be convened regularly by the Chairperson and may be requested by any member of the committee. a.7. Committee decisions shall be by simple majority and the Chairperson shall have the casting vote. a.8. The quorum shall constitute four committee members as follows: two executive officers and two other committee members. a.9.i. They tender their resignation in writing to the Chairperson and the Secretary. a.1. The Annual General Meeting shall take place in January. a.3. The election for all positions on the committee shall take place at the Annual General Meeting or, in the case of resignation, or dismissal at an Extraordinary General Meeting. a.4. No member shall be eligible to stand for election unless he/she has paid his/her full membership fee beforehand. a.5. The Returning Officers shall be the Chairperson and one other, nominated by the Committee. a.6. An Extraordinary General Meeting must be convened by the committee, if the Chairperson or six members of the club request it in writing. a.7. At least two weeks notice shall be given of any Extraordinary General Meeting, by posting a clear notice on the whatsapp club notice board. a.8. A quorum at General Meetings shall be 15 voting members or 20% of the current voting members, whichever is the lower. a.9. Such meetings will deal only with the issues for which it has been called and emergency issues brought to the attention of the extraordinary general meeting shall require a 50% plus one majority of those attending in order to be discussed. At such meetings any member of the committee, with the exception of Chairperson, may be dismissed provided that a two-thirds majority of members (three quarters for Chairperson and Treasurer) present and voting are in favour of such a dismissal. If, at such a meeting, an Officer is dismissed a new member may be elected to replace him/her providing a simple majority of the members present and voting are in favour of his/her appointment. Nominations may be taken from the floor. a.10. No assembly not complying with these conditions shall be deemed an Extraordinary General Meeting. a.1. Duties of Chairperson: The Chairperson shall endeavour to ensure that the aims and objectives of the club shall be attained. The Chairperson shall be responsible to the committee and they in turn shall be responsible to all members of the club. No member may stand to be Chairperson unless he / she has attended at least 50% of club meetings or activities. a.2. Duties of Secretary: The secretary shall ensure the minutes are taken or every meeting, shall have charge of all records and correspondence within, on behalf of and pertaining to the club, and shall report and make recommendations thereon to meetings. a.3. The Treasurer: This Officer shall be responsible for ensuring that there be no misuse of club funds and for conducting an end-of-year audit of all club accounts. a.4. The Armourer shall maintain all weapons, electronic equipment, and other facilities of the club in good order and condition, shall know their whereabouts at all times and ensure their availability when required and shall make reports and recommendations to meetings. The Armourer shall also be the Safety Officer with responsibility to devise proper safety procedures and to ensure that these are strictly followed so that the well-being of club members and the general public is not put at risk by the clubs activities. a.5. The Child Protection Officer has responsibility to establish a child centred ethos within the club, and is the Clubs Designated Liaison Officer for child welfare concerns. a.7. It shall be the duty of every member of the committee to familiarise themselves with the constitution and it shall be the duty of the Chairperson to ensure that he/she holds a definitive and current text of the same during his/her term of office. a.1. Further to duties outlined in article 5, additional responsibilities may be allocated to any officer by resolution in committee meetings, he/she shall be reasonably available at all times to assist the officers of their special duties and to do whatever the club chairperson may reasonably expect him/her to do. a.2.i. Regular training sessions for members are held at a suitable venue. a.2.ii. The best available coaching services are provided for all members as often as possible. a.2.iii. Members who are novices are provided with every reasonable opportunity, and all necessary equipment to learn and master the basic techniques of fencing under expert supervision, ideally at a specialised course. a.2.iv. Friendly contacts are initiated, fostered and maintained with other fencing organisations, of all types, at all levels including affiliations where appropriate. a.2.v. Members must be kept properly notified of all proposed activities of the club. a.1. If circumstances demand, the club chairperson may undertake the special duties of any officer or may take any decision or action independent of the committee. For any deed or decision of the club chairperson to be considered an executive action, he/she must forward an immediate written explanation to the Secretary. This document must be discussed at the next committee meeting and can only be overturned by a special resolution of a full committee meeting. a.2. A petition is a written notification presented to the secretary through which the members of the club demand a certain course of action to be taken and is signed by 40% of the members on the club registrar. The presentation of a petition to the secretary requires that a committee meeting shall be convened within five clear days of presentation to the secretary. A petition can only be overturned by resolution of an Extraordinary General Meeting. a.1. An amendment must be proposed by at least ten members, or the committee. a.2. Amendments may be passed by a two-thirds majority at General Meeting of the club, in accordance with the procedures laid down in this constitution. a.3. All amendments to the constitution must be forwarded in writing to the Secretary twenty-eight days in advance of a General Meeting. a.4. Copies of any proposed amendments must be displayed on the club whatsapp group for twenty days prior to a General Meeting. a.5. This constitution remains in place until amended as above or until terminated. Termination of this constitution may only be proposed a minimum of one full calendar year in advance. It must be proposed and discussed at two AGM’s and may only be voted on at the second AGM. A new constitution may subsequently be proposed as above amendment conditions.